Kauai is that rare destination that doesn’t just live up to the hype — it transcends it. There’s simply no way to capture its ancient, powerful landscape in words, or to convey the otherworldly mystique that pervades this pastoral island (the oldest in the Hawaiian archipelago). Hawaiians talk of mana, which loosely translates to spiritual energy. On Kauai, the magic of mana takes hold straightaway, tightening its grip the longer you’re there. Perhaps the most appealing thing about Kauai for families, though, is that it can be whatever you need it to be. It’s a place of contrasts: low-key leisure and high-octane adventure, placid shallows and crashing surf, palm-flecked beaches and jagged cliffs. No town has more than 11,000 people; no building is allowed to rise higher than a coconut tree; and most of the land is a patchwork of taro farms, untamed valleys and tangled rainforests. Yet pockets of luxury, culture and convenience abound, if you know where to look. I recently spent an extraordinary few days on Kauai, and over the coming weeks I’ll share more about the best ways to experience the Garden Isle’s many faces. In the meantime, here’s what you need to know if you’re pondering a Kauai getaway with your keiki (little ones). Choose more than one home base. Kauai’s four sides are distinct: the calm, fair South Shore; the busy eastern coast; the remote and rural North Shore; and the rugged, largely inaccessible west side. To experience the island at its fullest, base in at least two places. This also saves a lot of backtracking — since there’s essentially a single roadway along the coast, getting from point A to point B can eat up time. For more about where to stay, scroll down. Decide which season suits you. Kauai’s high seasons run from December through early spring, and summer through Labor Day. Shoulder seasons, such as fall, balance lower crowds with lovely weather. You can count on some rain no matter when you visit, but summer is usually driest. The winter months, especially on the North Shore, can be damp with rougher seas. Winter’s upside? Rain plumps up the foliage and keeps waterfalls robust. Even when it’s drizzling on the northern coast, odds are you’ll find sunshine to the south and west. And this is also peak time for whale-watching. Rent a car. I can’t stress this enough. There’s a bus network, but it doesn’t hit prime tourist spots or the hidden gems that are key to Kauai’s beauty. Driving on the island is easy and rental cars are affordable, so there’s little reason not to have your own wheels. Be careful where you swim. Wherever you see more than three cars pulled over to the side of the highway on Kauai, you’ll probably find a beach. Don’t dive in without doing your homework, however: Rogue waves and rip currents here are no joke. Not all beaches are swimmable, so it’s important to ask where you should and shouldn’t go in the water. Lifeguarded beaches are the safest bet, but always check the surf reports first. Bring old clothing for adventure activities. Kauai’s red soil is so tenacious that local companies use it to dye souvenir T-shirts. If you get it on your clothes, which kids almost certainly will, it may be there for good. I learned this the hard way; after a fun but muddy rainforest trek, my hiking shoes were beyond rescue. Poipu. The South Shore’s Poipu area is absolutely ideal for families. It’s geared toward tourism, but with kids, that’s not a bad thing. Dry and sunny, it has an extensive infrastructure without feeling overdeveloped. The beaches here are calm year-round and good for swimming as a rule. “Baby Beach,” a sheltered patch of sand that slopes gently into the water, works perfectly for toddlers and preschoolers. I’m always a fan of condo-style accommodations, and Poipu’s Outrigger Kiahuna Plantation fits the bill. Units are simple but clean and spacious, clustered around a pretty, manicured lawn that overlooks Poipu Beach. The onsite botanical garden, with free admission, is a treat, filled with native Hawaiian plants as well as drought-tolerant succulents. Plantation Gardens restaurant onsite serves dinner only, but full kitchens in all the units and grocery shopping nearby make it easy to eat in. The property also lies across the street from a cute retail village with boutiques, eateries and more. Note: Outrigger Kiahuna shares grounds with Castle Kiahuna, which is part of our CB! Hotel Collection. For a luxury option in Poipu, we like Koloa Landing — I didn’t experience this property, but our clients have raved about it. The North Shore. Picking the loveliest part of Kauai is really splitting hairs. Still, if I had to nail one down, the North Shore would win. Secluded, dramatic and arrestingly lush, it’s a totally singular part of the island. It’s also the rainiest, but don’t let that put you off; showers seldom last long. My choice for this area is Hanalei Colony Resort, a group of rustic yet well-appointed condos on the fringe of a small bay. Mine was spotless, with a nicely outfitted kitchen, a huge bathroom and a roomy lanai. Even better, though, is the configuration: All of the units have two bedrooms that can be closed off with sliding doors at night, then opened up in the daytime for extra living space. It’s worth booking an oceanfront unit for the stunning views over the water. There are no TVs or phones in the rooms (I consider this an advantage — Hanalei Colony is a place to escape, unplug and unwind). There’s also no breakfast, other than a few baked goods at the onsite coffee shop/art gallery, so you either need to stock the fridge or head into Hanalei or Princeville. Free shuttle service runs during the day, and you can charter the shuttle outside regular hours. The upscale Mediterranean Gourmet restaurant on the grounds has lunch and dinner and hosts a weekly luau. The North Shore is also home to some of Kauai’s most luxurious resorts. I toured the Westin Princeville Ocean Resort Villas and came away impressed. Studio, one-bedroom and two-bedroom villas are beautifully decorated and all have kitchens or kitchenettes. Family amenities include a kids’ pool and a full-day club for ages 5 to 12. Kapaa. Kapaa perches on the eastern Coconut Coast, named for the groves of coconut palms in the area, about midway between urban Lihue and the North Shore. As on the south side, weather tends toward sunny, and there’s no better place to take in one of Kauai’s knockout sunrises. The biggest plus, though, is convenience: Kapaa is 20 minutes to Lihue Airport, 30 minutes to Princeville, and stuffed with grocery stores, restaurants, shops et al. Know that this is the most populated part of the island and relatively built up; it’s not about pristine scenery here. Still, some of Kauai’s prettiest beaches are in this area. Lydgate Beach is calm enough for swimming with toddlers, and there’s also a fabulous playground, Kamalani — a great find on an island where playgrounds tend to be of the natural sort. Kapaa Beach Park has a paved bike/walking trail that overlooks the waves and is easy to navigate with a stroller. I stayed at Plantation Hale Suites in a bustling stretch of Kapaa. The property is no-frills, but the staff is friendly and accommodating, and the setup works well for families. I especially like the renovated deluxe suites — mine had a full kitchen, standalone bedroom, living room with sleeper sofa, and air-conditioning (not as common on Kauai as you’d think). Each building on the property includes its own laundry room, which saves a ton of schlepping with young kids. The hotel also offers three outdoor pools, though I didn’t get a chance to check them out. Kapaa Town, a charming enclave of boutiques, surf shops, food trucks, markets and more, is just a mile or two down the road. For families who want value-oriented accommodations with easy access to services, Plantation Hale is a good choice. 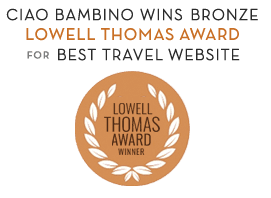 Editor’s Note: Ciao Bambino was hosted by the Kauai Visitors Bureau in order to provide comprehensive coverage. As always, our opinions are our own. Photos by Lisa Frederick. Kauai is so amazing. It does exceed any hype. I have done OK by having one base. The island is small enough that driving around is no big deal. My family has been debating which Hawaiian island we should visit on our first trip. Clearly, we can’t go wrong on Kauai. Thanks for the information! Oh, how I love Hawaii! Kauai is such a beautiful, laid-back island, visitors of all ages are sure to find something they love here!